“InstaFame” is a song about her rise to stardom through social media, specifically YouTube, before her stint on RuPaul’s Drag Race. The music video is set in a country scene, with her in a pink cowgirl, or should I say “cowgurl” outfit, going on a duel with a rogue cowboy in black. Ok, just watch the video for the fashion and story. The video is like going back to her country roots, having been raised in a farm and all. It is refreshing to watch, but the video seem short – a characteristic of a captivating video, at least to me. I like the plot and the execution of the storyline. Though, I would’ve liked it better if some scenes had better lighting, like when she was singing next to the horse, yes, there’s a horse … a white horse, and the indoor scenes of her dancing in half-body shots. But I get the darker shadows in the tight shots, those were great. I guess it’s tricky to have a “Old Western” theme video without extras, right? It makes total sense this time to have a villain and damsel, or damsels, in distress … a.k.a. the bound and gagged bar boys. But why was the car shot running in reverse? I don’t get that part. Splitting hairs here, lol. And speaking of cars, the shot of her inside the car driving pretty good. That was a look … a great look. I thought she tripped at 2:55, but after a closer look, it seemed the horse decided to munch on grass … I guess? Horse be hungry, lol. The scene with her riding a mechanical bull amidst onlookers at a bar was pretty neat to watch. A gyrating body on a mechanical bull in slow motion is always nice to watch. It reminds me of Kylie in “Sensitized.” I guess riding the white horse was too dangerous, especially with her wearing that fabulous pink cowgirl outfit? For the love of the gods, buy it! 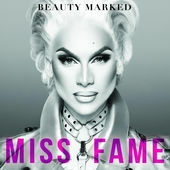 Miss Fame is the New Sheriff in town or the Western Blonde Barbie Fantasy. Special Thanks to Tracks Denver, Bull Corp Inc., Erik Arrendondo, Jeremy Tyler, Sven Challenger, Michael Furman, Canon Ridge Farms, The American Black West Museum and Deerfield Colorado.